Eastern culture. Laws. Those typically don’t mix well together culturally. Let me explain. 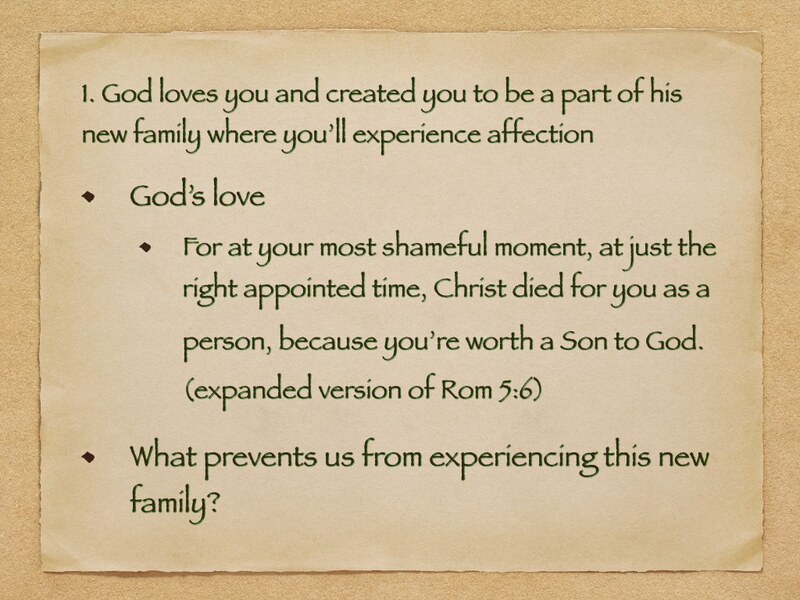 When I first wrote this to present to Cru (formally Campus Crusade for Christ) in 2006 and 2007, I had no intention this this would ever be used for evangelism. 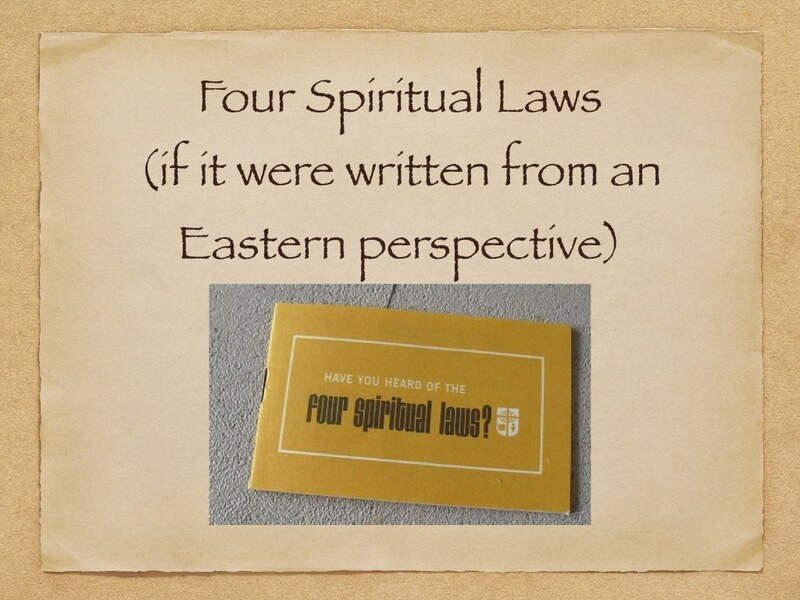 Because although this is titled “4 laws for those in an Eastern Perspective”, the fact that I use the word “law” is already a “miss” for a culture that operates with “it’s acceptable because no one sees me” mentality. Eastern culture does not relate to propositions. One does not necessarily convince someone or strike a business deal with those who relate to Eastern culture by “propositions” alone. In a group-oriented culture, you need to have a relationship first. Many already know this, but for some reason, it’s not been applied to discipleship and evangelism in Christ’s church. Those outside Christ need to feel their separation from God. Guilt often does NOT bring about that feeling. “I did not do anything wrong” is the common sentiment from people of this culture whether they know it or not. That said, I wrote the following as an illustration to highlight how shame separates people from God. So although I never intended this to be used for evangelism, I know it’s been used for training and for evangelism, in English and in Chinese. In these series of posts, I’ll share my attempt at rewriting each of these traditional laws from an Eastern perspective. And for those who want the Chinese version (translated by a Chinese theologian friend of mine), that’ll be a part of these posts as well. Asians come from a culture with a higher group, family identity. Yet love often times comes conditionally to this culture. I’ve done exercises with hundreds across the States among mainly Asians and Caucasians. Almost always, love in an Asian context shows itself to be conditional. That is, love is withheld as a function of performance. It’s no wonder that legalism is one of Satan’s largest ploys against the Asian-cultured church. I’ve seen this dynamic among Asians in an Asian church and among Asians who have left the Asian church, if they’ve not sorted their culture of origin. Therefore, the Gospel for those who come from a group, family culture offers a “new family” where the Heavenly Father offers an unconditional love that FEELS affectionate. That “feeling” is the salve that heals and restores true humanity in a culture that suppresses feelings, a culture that suppresses oneself for that matter. THIS kind of Father’s love is not common in Asian culture. But He is indeed the intended Father for everyone who deals with shame. And for such a “face” culture, for a culture that suppresses “what’s really going on,” the Father meets us in those places where we most want to hide. And that place is where we’ve experienced the most shame. In fact, per the quoted verse, in THAT perfect kairos appointed time, that is where we experience the unconditional love of Christ. But like the Samaritan woman in John 4, when we first encounter this brand of love, we might resist. In fact, we’d perhaps instinctually want to go back to old escape patterns. They are just more “comfortable.” What’s really going on here? That’s for the next post in this series….